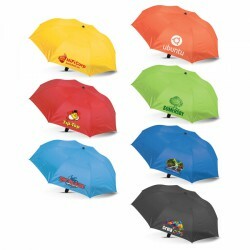 Promotional folding umbrellas grabs your clients' attention and are a perfect corporate gifts. 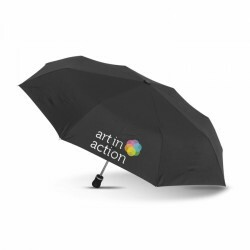 A customer favourite for the effective way they boost brand visibility, branded compact umbrellas are great as conference giveaways or business gifts. 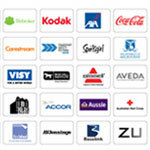 Their compact sizes mean conveniences while their huge branding areas benefit your marketing campaign. 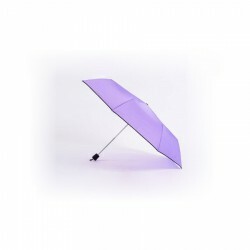 Promotional Product Experts offer a delightful collection of lightweight and foldable umbrellas which can be custom printed with your brand name or logo. Choose from different designs and colours. 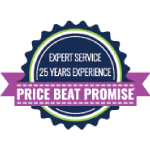 If you wish to enjoy more savings, enquire about bulk orders. 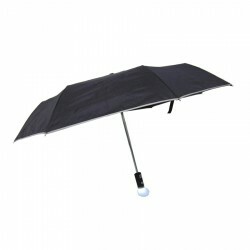 Two- function black Collapsible Umbrella in black plastic tube, with LED torch. Supplied with 2 x batteries., Supplied in black gift box. Leather look hook handle and auto open feature makes this the perfect choice for any businessman. The ultimate car umbrella. Compact 3 section folder that will fit into any glovebox. Auto open & close so you don't get wet. Torch to find the lock and reflective piping for safety. Every car should have one. 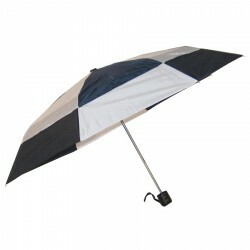 This folding umbrella has it all - auto open & close, vented, and a comfortable foam handle. 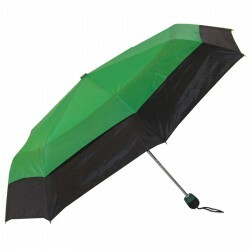 Our largest folding umbrella, and vented for windy conditions. Ideal for sporting events. Comes with its own carry bag. High Quality Foldable Umbrella, 8 Panel 190T Nylon Canopy, Auto Open and Close Feature, Stop and Hold Safety Feature, Black Moulded Rubber Handle. 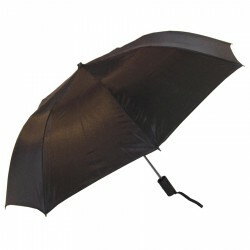 Black umbrella made from 100% polyester cloth with manual open function, 4 UV protected sections comes packaged in a wine bottle shaped holder made from PP, ABS material 47mm(diameter). 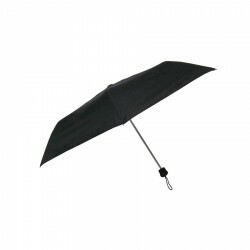 68cm rib folding size, 3 section nickel steel shaft, black runner, notch & ferrule, black rubber coated handle, gunmetal handle base & press button, auto open/close, 190T polyester canopy. 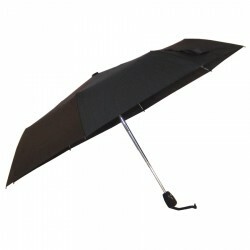 190T high quality nylon, 3 section shaft with wind safe frame. Auto open, Auto close, Rubberised handle with inset open/close button, Wrist strap, Matching nylon sleeve with cord and toggle. 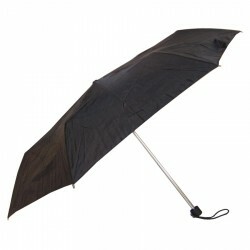 This micro umbrella is only 16.5cm long when folded - ideal for briefcase, handbag or even coat pocket. Supplied in silver carry case. 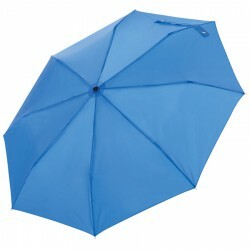 Double fold 52 cm, 8 panel umbrella with auto opening. 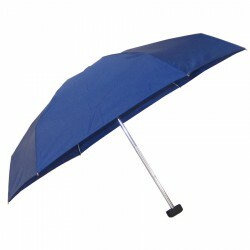 Has a strong 190T showerproof canopy which folds down to a compact 38 cm in length when not in use. The 8 rib frame is constructed from metal with a 2 stage metal shaft. Other features include a 190T slide on carry sleeve, plastic and leather look hand grip, metal tips, a velcro tie and hand strap. Automatic Opening. 91cm arc. Polyester canopy. Two section folding metal shaft. Black plastic handle. Folds to 36cm long. 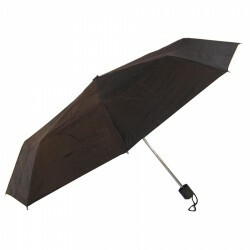 Classic-styled folding umbrella with engraved wooden handle and auto open function. Straight-handled folding umbrella with auto open. Fits easily into a briefcase or laptop bag. 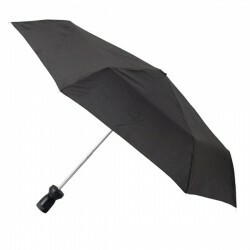 8 panel compact lightweight umbrella, 53cm rib length, Aluminium tube, Supplied in black gift box. 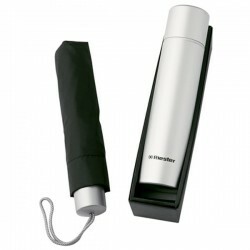 Silver plastic canister for super compact umbrellas. Will fit WL0061, WL0067. 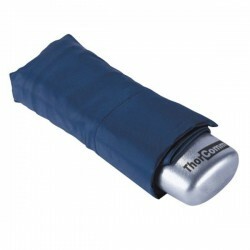 Aluminium canister for folder umbrellas. Comes with display box. Will fit WL0061, WL0067, WL001, WL002V, WL0077, WL0025V, WL0031, WC009, WL0041. 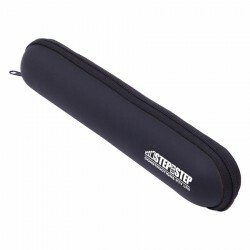 3 section folder with safety runner and rounded plastic tips. EVA handle perfect for smaller hands and in all the popular school colours. 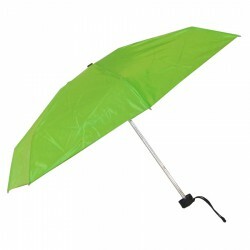 Our budget folding umbrella, priced to please. A great option for the budget-conscious. Upgrade to an auto opening folding umbrella. An umbrella for the handbag. In bright colours with matching colour handle. 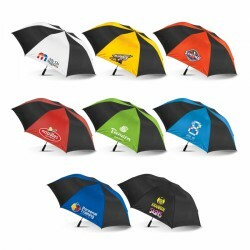 Great for the races or promoting your brand. Vented to withstand those gusty winds. 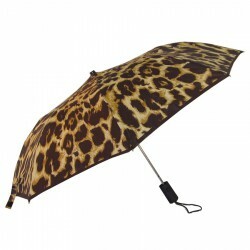 Join the trend to vented folding umbrellas. Ideal in windy conditions. 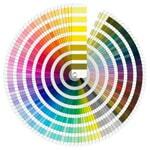 In a great range of colours. (Available in Aust. only). LIMITED STOCK. 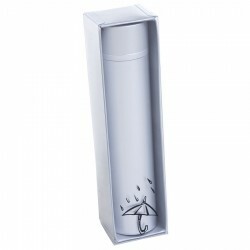 A colour co-ordinated cover and handle makes this folding umbrella stand out from the rest. 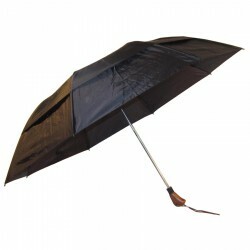 This is the strongest, most robust folding umbrella we have seen! The latest in design technologies and materials. Super compact, only 15cm length when closed. Trendy colours and will fit into any handbag when closed. Sleeve in matching colour with black trim.LIMITED STOCK. 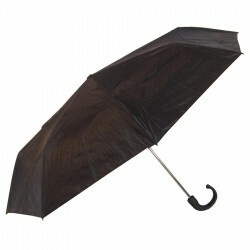 The ideal super-compact travelling umbrella at only 17cm long. 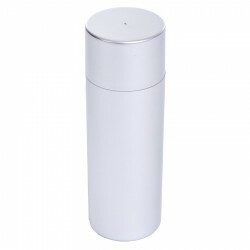 Choose from clear plastic case, zipped black fabric case, or silver canister at no additional cost. 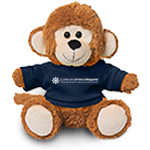 The latest in European styling and small enough for any pocket. 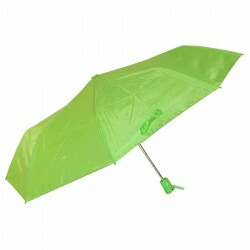 The ideal corporate and very popular folding umbrella. With auto open & close so you don't get wet getting in and out of the car! The latest technology in folding umbrellas with a new safety close feature. Fibreglass ribs to give strength where it is needed most. 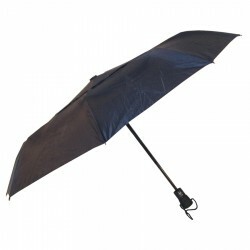 Our very popular gents folding umbrella for the budget-conscious. Manual open. Manual opening. 104cm arc. Polyester canopy. Three-section folding metal shaft. Ergonomic matte black plastic handle with wrist strap. Folds to only 24cm long.